The word ACRAGLAS has proven, during the many years it has been used by shooters, to be a true and fair product description. For Acraglas, as its name implies, is an accurizing material designed for the exclusive purpose of making a rifle shoot more accurately. Granted, it is a superior bedding compound used and sold as such by dealers, stock manufacturers and gunsmiths - but the fact remains: its prime purpose is to accurize a rifle. THE AMERICAN RIFLEMAN To quote L.R.W. in the American Rifleman Dope Bag, “Acraglas will be found an excellent preparation to correct poor bedding and the revitalized rifle should respond with considerably better accuracy.” “It’s a boon for the lazy, too, because if you are inletting a stock blank you simply cut out too much wood all the way around, gob the wood well with Acraglas, put the metal in (properly treated with release agent coming with the kit) and set aside for about 24 hours. When the metal is removed, the result is perfect bedding for the action - good, strong, and reliable bedding it is, too.” PROVEN IN THE FIELD As the manufacturers of Acraglas, we cannot help but be very proud, too, of the many individual shooters and teams who have won big bore regional and Perry matches with Acraglassed guns ... and of the hunters who have sent us “before and after” targets made when sighting in their game rifles after using Acraglas. The basic materials used in Acraglas are those developed for the aircraft industry. These we have adapted to gun work. Some of the many unusual features of Acraglas are: Acraglas shrinks less than 1⁄10th of 1% when hardening. This is very important to you as a shooter, for the tighter your bedding job, the better the job. It must be remembered, too, that many of the plastics will shrink more than 5% when hardening, thus canceling their true values as accurizing materials. So perfectly does Acraglas fit your barrel and action that any stamping marks in the steel will also be there in the Acraglas ... impossible to “Bed” any closer. Acraglas actually strengthens your stock because of its own great strength and resistance to breakage or warpage! Acraglas is acid proof, waterproof, has superior insulating qualities, resists alkalies and will not rot or deteriorate. It is quite well known that many of the so-called “plastic glasses” do deteriorate and products made from them are only guaranteed 5 years. Acraglas is highly resistant to impact and will not dent. Should it ever be damaged, or if an improper job is done the first time, it can easily be corrected or mended by using the same materials as in the Kit. Thus, it makes the perfect recoil shoulder. Unlike paints or air drying plastics, Acraglas hardens by chemical action. So, a hard surface indicates a hard interior ready for finishing. The mixture becomes hot before reaching setting temperature. It then “kicks over” and begins to harden, reaching full hardness in 48 hours, altho’ it can be worked, sanded and finished before then. Acraglas has a shelf life of over 5 years! Acraglas has been so compounded by our research engineers that you have ample time to properly seat the barreled action in the inletted stock before it starts to harden. Therefore, when using it you do not need to become nervous and rushed, but can take your time and do the First Class Job you are capable of doing. Being a superior bedding compound, you get a double- barreled benefit when using Acraglas: - An excellent bedding job that does not carry the stigma of “plastic bedding” and you have concentrated your real efforts on accurizing your gun - all at the same time! For your own enlightenment you should check among your shooting friends and note how many are proud of their guns being Accurized with Acraglas. Acraglas completely seals the inletted side of the gun stock against all moisture, gun oils, solvents and sprays. Moisture being absorbed by the stock can cause the finest woods to warp or twist, forcing the gun to shoot different groups on different days. Oils and solvents will eventually make the most beautiful of woods dirty looking where allowed to soak in and, in rare cases, actually ruin the wood. Acraglas has another feature that is strictly a side benefit - but, one our gunsmith customers have found out for themselves and use extensively. The bonding strength of Acraglas is phenomenal - will actually stick “anything to anything” (except certain poly-plastics). The letters in our files make one shake his head in wonder. It seems our gunsmiths have repaired everything from false teeth, toilet bowls, pipes, chairs, cribs, cars, radios, TV’s, skis, sleds, tables, flintlock rifles, caplock rifles and modern gun stocks without number. What it amounts to is this: You name something that has been busted and one of them has undoubtedly used Acraglas to fix it! But, we play this down. We are not in the glue business. There are a jillion glues but only one Acraglas! RELEASE AGENT Our traditional Release Agent and our easy-to-ship, Non-Flammable Release Agent selectively lets Acraglas bond to the stock but not to the barreled action. Both products present nearly indentical physical characteristics, and are applied in exactly the same manner with no noticeable difference in dry time. Both form a smooth, vinyl-like coating between the bedding compound and metal. Non-Flammable Release Agent is a non-flammable, non-hazardous formula that can be transported by air, immediately upon request, safely and legally within and outside the Continental U. S., so there’s no more waiting for ground shipments to arrive when you need an Acraglas kit or extra release agent in a hurry. WHO USES ACRAGLAS AND WHY STOCK MANUFACTURERS - For special custom accurizing jobs and for resale to dealer and retail accounts. PROFESSIONAL STOCKMAKERS - For obtaining skin-tight bedding around receivers, at the chamber on the barrel and at the forend tip on certain jobs. GUNSMITHS - For the complete gamut of stock work - the complete inletting job, the accurizing of an erratic shooting gun and for the super-duper stock where the same techniques are used as by the fulltime stockmaker. GUN HOBBYISTS AND BUFFS - To accurize their present guns or to bed and accurize guns they are stocking; also, to simplify bedding barreled actions into inletted stocks purchased from stock manufacturers ... a great boon for the man who likes to do the job himself - and wants the best results. INSTRUCTIONS AND COLOR Acraglas in itself is amber-clear. To make it match your stock - black or brown - we furnish two special, acrylic dyes with each Kit. With them you can color the Acraglas mix to blend properly with the color of your individual stock - wood or synthetic. The brown dye nicely matches “normal” walnut but if your stock is exceptionally light walnut, or made of maple, myrtle, cherry, etc., you may want to leave out the dye for a closer match. Just remember, the color you see in the cup will darken somewhat when the Acraglas is in the stock. But, you don’t have to match the color, many shooters like to create contrast at the joining of barrel and stock to add a point of distinction to their gun and make sure others know they’ve taken the time to do a first-rate glass bedding job. Complete, easy-to-follow Instructions are packaged with each Kit. These tell you how to mix and use. FOLLOW THEM CAREFULLY. ACRAGLAS KIT - 2 fl. oz. (59 ml) Resin, 7⁄8 fl. oz. (26 ml) Hardener, 7⁄8 fl. oz. (26 ml) Release Agent, Floc, 2 Mixing Cups, Mixing Stick, Brown Dye, Black Dye enough to bed 2 Rifles. Complete Instructions. ACRAGLAS SHOP KIT - 28 fl. oz. (828 ml) Resin, 7 fl. oz. (207 ml) Hardener, 3 fl. oz. (89 ml) Release Agent, 8 oz. (227g) Floc, 24 3 oz. capacity Mixing Cups, 50 Mixing Sticks, 5 Packets Brown Dye, 5 Paks Black Dye and Instructions. I used this product to fill in some amateur holes in a stock. Very complicated instructions, to much verbiage. Need better tech writers. Has lots of bubbles, like foam, when it sets up. When using two drops of brown dye and two drops of black dye, still looks yellow. Dye system is a big fail. Very disappointed in this product. Will never use again. Feel like I was ripped off. I had the option of this product (not sure about flammable or non flammable) and the gel. I chose this over the gel for no specific reasons and was impressed with the results. I worked it in the tight spots slowly and filled in the larger spots evenly and much to my surprise when the action was removed there was a smooth as glass bedding job. I had no bubbles or air pockets. I did have some flowing into areas i didnt expect although i can NOT fault this product but blame more fault on using Play-Doh that was sort of hard and caved away. A little extra clean up on my part while it was just starting to stiffen up made easy work of my goof up. About 12 to 14 hours of setup and I popped the action out of the stock easier than expected. (Honestly almost dropped the barreled action when it popped free) A little trimming with a sharp blade and it looked like it was done by someone with years of experience. I have read a lot of reviews on other products as well as this product and this is the only brand that was available at the shop, so I figured of they use it there's probably a good reason. I'm glad I used it and will use it again in the future. I've used Acraglas since I bought it in the mid 70s to bed an early M1A. Since then I always seem to find uses for it from laminating wood, to repairing and strengthening wood in place of carpenters glue and repairing old neglected wood. I always keep the big containers around since I always find new ways of using it. Versatile, strong, durable. I can't say anything bad about the product other than read the instructions! They help with this one. I use Acraglas for a number of things dating back to the mid 70s when I first bedded an early M1A. I use it to laminate wood, repair wood, fix screws that have stripped out of wood. It's probably one of the most versatile and durable epoxy compounds around. At the moment I've using it to fix a friend's porch where the wood was neglected for years. It's saving him a rebuild and does really nicely adding strength to the wood. I always keep these two large containers of Acralgas around. furniture will break be for the resin lets go. I just used Acraglas to repair a buttstock for an old hammer double shotgun. The stock was broken into four pieces in the wrist/lock area although most of the wood was still there. After planning the order of gluing, I used brown-dyed Acraglas and glued and clamped, allowing plenty of time for the compound to cure. More dyed Acraglas filled in a couple of cracks and a small missing piece. The cured fill material was lightly textured to approximate the grain and pore pattern of the original walnut, then I used stain markers (from the local paint store) to match the color. Looks pretty good, too. I've been using this professionally for about 20yrs. Probably the most difficult bedding material for a beginner to get a nice finished job with. Best feature for me is that I can tint it to match wood stocks closely(with my own formuala dye) and I can control the thickness. The last several 28oz bottles of resin I have bought have started to hardened on the bottom (within a few months) and I've had to throw out quite a bit before the bottle was empty. Acraglas is the shops go to fix all. It's already known as a superior bedding compound, so if you are doing more than one gun to even a few guns, you may consider getting this quantity of Acraglas and hardener. If it's a slow go and you don't do too many at first and the contents glaze over, a simple quick touch in the microwave and you're good to go with all of the liquid ready to pour so it has a very long shelf life. Not only good for action bedding, it's great for putting parts together and for making all sorts of jigs like a frame jig for your action wrench and to lock on a homemade tool into a handle. Ever had a file slip from its handle? Grind a couple of notches into the handle portion of the file and fill the handle with Acraglas prior to inserting the file. Let harden overnight and in the morning the file is there to stay in its handle without the slightest chance of slipping for the life of the file or handle. Same for Lee Mold handles. Works like a champ. No shop should be without it. Smithy. I've bought this kit several times over the years. People need to be aware that if the resin gets cold it can start to crystallize. Once this starts it will continue to crystallize even at normal temperatures. THIS DOES NOT MEAN IT HAS GONE BAD! You simply need to heat the bottle in hot water to melt the crystal and it returns to normal. The shelf life on this product is many many years. I use this epoxy in a machine shop to refurbish vacuum fixtures, to laminate phenolic, wood and G10 sheet, and to bond knife scales to the tang in knife production. Get the mixing ratios exactly right and mix for four minutes and you have the strongest most durable bond I've ever found. I even bedded a rifle with it once. Beginning in 1960 I originally used AcraGlas for Glass bedding and repairs. After Acraglas Gel came along I used it for repairs. I never had a failure in 49 years of gunsmithing and now I am retired and woodworking as an amateur. I use it as the adhesive of last resort. Mostly on less than perfect joints. Aviation background, part time knife maker and amateur gunsmith. This is the best I've ever worked with when quality counts. Having tried others, I would even give some a '4' , this is an outstanding '5' .! Good people to work with when I had a few questions years ago. 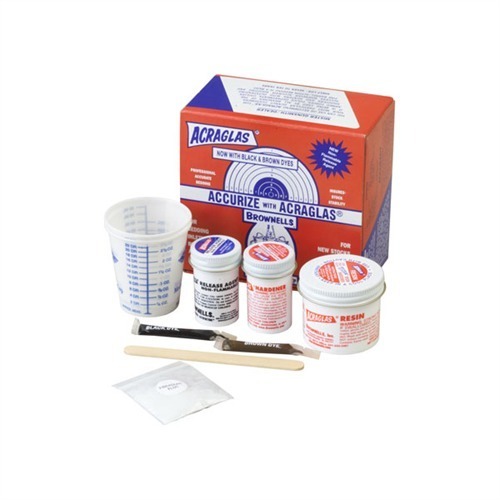 2 Gun ACRAGLAS Kit, Non-Flammable 050806105485 The word ACRAGLAS has proven, during the many years it has been used by shooters, to be a true and fair product description. For Acraglas, as its name implies, is an accurizing material designed for the exclusive purpose of making a rifle shoot more accurately. Granted, it is a superior bedding compound used and sold as such by dealers, stock manufacturers and gunsmiths - but the fact remains: its prime purpose is to accurize a rifle. THE AMERICAN RIFLEMAN To quote L.R.W. in the American Rifleman Dope Bag, “Acraglas will be found an excellent preparation to correct poor bedding and the revitalized rifle should respond with considerably better accuracy.” “It’s a boon for the lazy, too, because if you are inletting a stock blank you simply cut out too much wood all the way around, gob the wood well with Acraglas, put the metal in (properly treated with release agent coming with the kit) and set aside for about 24 hours. When the metal is removed, the result is perfect bedding for the action - good, strong, and reliable bedding it is, too.” PROVEN IN THE FIELD As the manufacturers of Acraglas, we cannot help but be very proud, too, of the many individual shooters and teams who have won big bore regional and Perry matches with Acraglassed guns ... and of the hunters who have sent us “before and after” targets made when sighting in their game rifles after using Acraglas. The basic materials used in Acraglas are those developed for the aircraft industry. These we have adapted to gun work. Some of the many unusual features of Acraglas are: Acraglas shrinks less than 1⁄10th of 1% when hardening. This is very important to you as a shooter, for the tighter your bedding job, the better the job. It must be remembered, too, that many of the plastics will shrink more than 5% when hardening, thus canceling their true values as accurizing materials. So perfectly does Acraglas fit your barrel and action that any stamping marks in the steel will also be there in the Acraglas ... impossible to “Bed” any closer. Acraglas actually strengthens your stock because of its own great strength and resistance to breakage or warpage! Acraglas is acid proof, waterproof, has superior insulating qualities, resists alkalies and will not rot or deteriorate. It is quite well known that many of the so-called “plastic glasses” do deteriorate and products made from them are only guaranteed 5 years. Acraglas is highly resistant to impact and will not dent. Should it ever be damaged, or if an improper job is done the first time, it can easily be corrected or mended by using the same materials as in the Kit. Thus, it makes the perfect recoil shoulder. Unlike paints or air drying plastics, Acraglas hardens by chemical action. So, a hard surface indicates a hard interior ready for finishing. The mixture becomes hot before reaching setting temperature. It then “kicks over” and begins to harden, reaching full hardness in 48 hours, altho’ it can be worked, sanded and finished before then. Acraglas has a shelf life of over 5 years! Acraglas has been so compounded by our research engineers that you have ample time to properly seat the barreled action in the inletted stock before it starts to harden. Therefore, when using it you do not need to become nervous and rushed, but can take your time and do the First Class Job you are capable of doing. Being a superior bedding compound, you get a double- barreled benefit when using Acraglas: - An excellent bedding job that does not carry the stigma of “plastic bedding” and you have concentrated your real efforts on accurizing your gun - all at the same time! For your own enlightenment you should check among your shooting friends and note how many are proud of their guns being Accurized with Acraglas. Acraglas completely seals the inletted side of the gun stock against all moisture, gun oils, solvents and sprays. Moisture being absorbed by the stock can cause the finest woods to warp or twist, forcing the gun to shoot different groups on different days. Oils and solvents will eventually make the most beautiful of woods dirty looking where allowed to soak in and, in rare cases, actually ruin the wood. Acraglas has another feature that is strictly a side benefit - but, one our gunsmith customers have found out for themselves and use extensively. The bonding strength of Acraglas is phenomenal - will actually stick “anything to anything” (except certain poly-plastics). The letters in our files make one shake his head in wonder. It seems our gunsmiths have repaired everything from false teeth, toilet bowls, pipes, chairs, cribs, cars, radios, TV’s, skis, sleds, tables, flintlock rifles, caplock rifles and modern gun stocks without number. What it amounts to is this: You name something that has been busted and one of them has undoubtedly used Acraglas to fix it! But, we play this down. We are not in the glue business. There are a jillion glues but only one Acraglas! RELEASE AGENT Our traditional Release Agent and our easy-to-ship, Non-Flammable Release Agent selectively lets Acraglas bond to the stock but not to the barreled action. Both products present nearly indentical physical characteristics, and are applied in exactly the same manner with no noticeable difference in dry time. Both form a smooth, vinyl-like coating between the bedding compound and metal. Non-Flammable Release Agent is a non-flammable, non-hazardous formula that can be transported by air, immediately upon request, safely and legally within and outside the Continental U. S., so there’s no more waiting for ground shipments to arrive when you need an Acraglas kit or extra release agent in a hurry. WHO USES ACRAGLAS AND WHY STOCK MANUFACTURERS - For special custom accurizing jobs and for resale to dealer and retail accounts. PROFESSIONAL STOCKMAKERS - For obtaining skin-tight bedding around receivers, at the chamber on the barrel and at the forend tip on certain jobs. GUNSMITHS - For the complete gamut of stock work - the complete inletting job, the accurizing of an erratic shooting gun and for the super-duper stock where the same techniques are used as by the fulltime stockmaker. GUN HOBBYISTS AND BUFFS - To accurize their present guns or to bed and accurize guns they are stocking; also, to simplify bedding barreled actions into inletted stocks purchased from stock manufacturers ... a great boon for the man who likes to do the job himself - and wants the best results. INSTRUCTIONS AND COLOR Acraglas in itself is amber-clear. To make it match your stock - black or brown - we furnish two special, acrylic dyes with each Kit. With them you can color the Acraglas mix to blend properly with the color of your individual stock - wood or synthetic. The brown dye nicely matches “normal” walnut but if your stock is exceptionally light walnut, or made of maple, myrtle, cherry, etc., you may want to leave out the dye for a closer match. Just remember, the color you see in the cup will darken somewhat when the Acraglas is in the stock. But, you don’t have to match the color, many shooters like to create contrast at the joining of barrel and stock to add a point of distinction to their gun and make sure others know they’ve taken the time to do a first-rate glass bedding job. Complete, easy-to-follow Instructions are packaged with each Kit. These tell you how to mix and use. FOLLOW THEM CAREFULLY. ACRAGLAS KIT - 2 fl. oz. (59 ml) Resin, 7⁄8 fl. oz. (26 ml) Hardener, 7⁄8 fl. oz. (26 ml) Release Agent, Floc, 2 Mixing Cups, Mixing Stick, Brown Dye, Black Dye enough to bed 2 Rifles. Complete Instructions. ACRAGLAS SHOP KIT - 28 fl. oz. (828 ml) Resin, 7 fl. oz. (207 ml) Hardener, 3 fl. oz. (89 ml) Release Agent, 8 oz. (227g) Floc, 24 3 oz. capacity Mixing Cups, 50 Mixing Sticks, 5 Packets Brown Dye, 5 Paks Black Dye and Instructions. 28 oz. Resin and 7 oz. Hardener The word ACRAGLAS has proven, during the many years it has been used by shooters, to be a true and fair product description. For Acraglas, as its name implies, is an accurizing material designed for the exclusive purpose of making a rifle shoot more accurately. Granted, it is a superior bedding compound used and sold as such by dealers, stock manufacturers and gunsmiths - but the fact remains: its prime purpose is to accurize a rifle. THE AMERICAN RIFLEMAN To quote L.R.W. in the American Rifleman Dope Bag, “Acraglas will be found an excellent preparation to correct poor bedding and the revitalized rifle should respond with considerably better accuracy.” “It’s a boon for the lazy, too, because if you are inletting a stock blank you simply cut out too much wood all the way around, gob the wood well with Acraglas, put the metal in (properly treated with release agent coming with the kit) and set aside for about 24 hours. When the metal is removed, the result is perfect bedding for the action - good, strong, and reliable bedding it is, too.” PROVEN IN THE FIELD As the manufacturers of Acraglas, we cannot help but be very proud, too, of the many individual shooters and teams who have won big bore regional and Perry matches with Acraglassed guns ... and of the hunters who have sent us “before and after” targets made when sighting in their game rifles after using Acraglas. The basic materials used in Acraglas are those developed for the aircraft industry. These we have adapted to gun work. Some of the many unusual features of Acraglas are: Acraglas shrinks less than 1⁄10th of 1% when hardening. This is very important to you as a shooter, for the tighter your bedding job, the better the job. It must be remembered, too, that many of the plastics will shrink more than 5% when hardening, thus canceling their true values as accurizing materials. So perfectly does Acraglas fit your barrel and action that any stamping marks in the steel will also be there in the Acraglas ... impossible to “Bed” any closer. Acraglas actually strengthens your stock because of its own great strength and resistance to breakage or warpage! Acraglas is acid proof, waterproof, has superior insulating qualities, resists alkalies and will not rot or deteriorate. It is quite well known that many of the so-called “plastic glasses” do deteriorate and products made from them are only guaranteed 5 years. Acraglas is highly resistant to impact and will not dent. Should it ever be damaged, or if an improper job is done the first time, it can easily be corrected or mended by using the same materials as in the Kit. Thus, it makes the perfect recoil shoulder. Unlike paints or air drying plastics, Acraglas hardens by chemical action. So, a hard surface indicates a hard interior ready for finishing. The mixture becomes hot before reaching setting temperature. It then “kicks over” and begins to harden, reaching full hardness in 48 hours, altho’ it can be worked, sanded and finished before then. Acraglas has a shelf life of over 5 years! Acraglas has been so compounded by our research engineers that you have ample time to properly seat the barreled action in the inletted stock before it starts to harden. Therefore, when using it you do not need to become nervous and rushed, but can take your time and do the First Class Job you are capable of doing. Being a superior bedding compound, you get a double- barreled benefit when using Acraglas: - An excellent bedding job that does not carry the stigma of “plastic bedding” and you have concentrated your real efforts on accurizing your gun - all at the same time! For your own enlightenment you should check among your shooting friends and note how many are proud of their guns being Accurized with Acraglas. Acraglas completely seals the inletted side of the gun stock against all moisture, gun oils, solvents and sprays. Moisture being absorbed by the stock can cause the finest woods to warp or twist, forcing the gun to shoot different groups on different days. Oils and solvents will eventually make the most beautiful of woods dirty looking where allowed to soak in and, in rare cases, actually ruin the wood. Acraglas has another feature that is strictly a side benefit - but, one our gunsmith customers have found out for themselves and use extensively. The bonding strength of Acraglas is phenomenal - will actually stick “anything to anything” (except certain poly-plastics). The letters in our files make one shake his head in wonder. It seems our gunsmiths have repaired everything from false teeth, toilet bowls, pipes, chairs, cribs, cars, radios, TV’s, skis, sleds, tables, flintlock rifles, caplock rifles and modern gun stocks without number. What it amounts to is this: You name something that has been busted and one of them has undoubtedly used Acraglas to fix it! But, we play this down. We are not in the glue business. There are a jillion glues but only one Acraglas! RELEASE AGENT Our traditional Release Agent and our easy-to-ship, Non-Flammable Release Agent selectively lets Acraglas bond to the stock but not to the barreled action. Both products present nearly indentical physical characteristics, and are applied in exactly the same manner with no noticeable difference in dry time. Both form a smooth, vinyl-like coating between the bedding compound and metal. Non-Flammable Release Agent is a non-flammable, non-hazardous formula that can be transported by air, immediately upon request, safely and legally within and outside the Continental U. S., so there’s no more waiting for ground shipments to arrive when you need an Acraglas kit or extra release agent in a hurry. WHO USES ACRAGLAS AND WHY STOCK MANUFACTURERS - For special custom accurizing jobs and for resale to dealer and retail accounts. PROFESSIONAL STOCKMAKERS - For obtaining skin-tight bedding around receivers, at the chamber on the barrel and at the forend tip on certain jobs. GUNSMITHS - For the complete gamut of stock work - the complete inletting job, the accurizing of an erratic shooting gun and for the super-duper stock where the same techniques are used as by the fulltime stockmaker. GUN HOBBYISTS AND BUFFS - To accurize their present guns or to bed and accurize guns they are stocking; also, to simplify bedding barreled actions into inletted stocks purchased from stock manufacturers ... a great boon for the man who likes to do the job himself - and wants the best results. INSTRUCTIONS AND COLOR Acraglas in itself is amber-clear. To make it match your stock - black or brown - we furnish two special, acrylic dyes with each Kit. With them you can color the Acraglas mix to blend properly with the color of your individual stock - wood or synthetic. The brown dye nicely matches “normal” walnut but if your stock is exceptionally light walnut, or made of maple, myrtle, cherry, etc., you may want to leave out the dye for a closer match. Just remember, the color you see in the cup will darken somewhat when the Acraglas is in the stock. But, you don’t have to match the color, many shooters like to create contrast at the joining of barrel and stock to add a point of distinction to their gun and make sure others know they’ve taken the time to do a first-rate glass bedding job. Complete, easy-to-follow Instructions are packaged with each Kit. These tell you how to mix and use. FOLLOW THEM CAREFULLY. ACRAGLAS KIT - 2 fl. oz. (59 ml) Resin, 7⁄8 fl. oz. (26 ml) Hardener, 7⁄8 fl. oz. (26 ml) Release Agent, Floc, 2 Mixing Cups, Mixing Stick, Brown Dye, Black Dye enough to bed 2 Rifles. Complete Instructions. ACRAGLAS SHOP KIT - 28 fl. oz. (828 ml) Resin, 7 fl. oz. (207 ml) Hardener, 3 fl. oz. (89 ml) Release Agent, 8 oz. (227g) Floc, 24 3 oz. capacity Mixing Cups, 50 Mixing Sticks, 5 Packets Brown Dye, 5 Paks Black Dye and Instructions. Mfr Part: FGA010128 050806101197 The word ACRAGLAS has proven, during the many years it has been used by shooters, to be a true and fair product description. For Acraglas, as its name implies, is an accurizing material designed for the exclusive purpose of making a rifle shoot more accurately. Granted, it is a superior bedding compound used and sold as such by dealers, stock manufacturers and gunsmiths - but the fact remains: its prime purpose is to accurize a rifle. THE AMERICAN RIFLEMAN To quote L.R.W. in the American Rifleman Dope Bag, “Acraglas will be found an excellent preparation to correct poor bedding and the revitalized rifle should respond with considerably better accuracy.” “It’s a boon for the lazy, too, because if you are inletting a stock blank you simply cut out too much wood all the way around, gob the wood well with Acraglas, put the metal in (properly treated with release agent coming with the kit) and set aside for about 24 hours. When the metal is removed, the result is perfect bedding for the action - good, strong, and reliable bedding it is, too.” PROVEN IN THE FIELD As the manufacturers of Acraglas, we cannot help but be very proud, too, of the many individual shooters and teams who have won big bore regional and Perry matches with Acraglassed guns ... and of the hunters who have sent us “before and after” targets made when sighting in their game rifles after using Acraglas. The basic materials used in Acraglas are those developed for the aircraft industry. These we have adapted to gun work. Some of the many unusual features of Acraglas are: Acraglas shrinks less than 1⁄10th of 1% when hardening. This is very important to you as a shooter, for the tighter your bedding job, the better the job. It must be remembered, too, that many of the plastics will shrink more than 5% when hardening, thus canceling their true values as accurizing materials. So perfectly does Acraglas fit your barrel and action that any stamping marks in the steel will also be there in the Acraglas ... impossible to “Bed” any closer. Acraglas actually strengthens your stock because of its own great strength and resistance to breakage or warpage! Acraglas is acid proof, waterproof, has superior insulating qualities, resists alkalies and will not rot or deteriorate. It is quite well known that many of the so-called “plastic glasses” do deteriorate and products made from them are only guaranteed 5 years. Acraglas is highly resistant to impact and will not dent. Should it ever be damaged, or if an improper job is done the first time, it can easily be corrected or mended by using the same materials as in the Kit. Thus, it makes the perfect recoil shoulder. Unlike paints or air drying plastics, Acraglas hardens by chemical action. So, a hard surface indicates a hard interior ready for finishing. The mixture becomes hot before reaching setting temperature. It then “kicks over” and begins to harden, reaching full hardness in 48 hours, altho’ it can be worked, sanded and finished before then. Acraglas has a shelf life of over 5 years! Acraglas has been so compounded by our research engineers that you have ample time to properly seat the barreled action in the inletted stock before it starts to harden. Therefore, when using it you do not need to become nervous and rushed, but can take your time and do the First Class Job you are capable of doing. Being a superior bedding compound, you get a double- barreled benefit when using Acraglas: - An excellent bedding job that does not carry the stigma of “plastic bedding” and you have concentrated your real efforts on accurizing your gun - all at the same time! For your own enlightenment you should check among your shooting friends and note how many are proud of their guns being Accurized with Acraglas. Acraglas completely seals the inletted side of the gun stock against all moisture, gun oils, solvents and sprays. Moisture being absorbed by the stock can cause the finest woods to warp or twist, forcing the gun to shoot different groups on different days. Oils and solvents will eventually make the most beautiful of woods dirty looking where allowed to soak in and, in rare cases, actually ruin the wood. Acraglas has another feature that is strictly a side benefit - but, one our gunsmith customers have found out for themselves and use extensively. The bonding strength of Acraglas is phenomenal - will actually stick “anything to anything” (except certain poly-plastics). The letters in our files make one shake his head in wonder. It seems our gunsmiths have repaired everything from false teeth, toilet bowls, pipes, chairs, cribs, cars, radios, TV’s, skis, sleds, tables, flintlock rifles, caplock rifles and modern gun stocks without number. What it amounts to is this: You name something that has been busted and one of them has undoubtedly used Acraglas to fix it! But, we play this down. We are not in the glue business. There are a jillion glues but only one Acraglas! RELEASE AGENT Our traditional Release Agent and our easy-to-ship, Non-Flammable Release Agent selectively lets Acraglas bond to the stock but not to the barreled action. Both products present nearly indentical physical characteristics, and are applied in exactly the same manner with no noticeable difference in dry time. Both form a smooth, vinyl-like coating between the bedding compound and metal. Non-Flammable Release Agent is a non-flammable, non-hazardous formula that can be transported by air, immediately upon request, safely and legally within and outside the Continental U. S., so there’s no more waiting for ground shipments to arrive when you need an Acraglas kit or extra release agent in a hurry. WHO USES ACRAGLAS AND WHY STOCK MANUFACTURERS - For special custom accurizing jobs and for resale to dealer and retail accounts. PROFESSIONAL STOCKMAKERS - For obtaining skin-tight bedding around receivers, at the chamber on the barrel and at the forend tip on certain jobs. GUNSMITHS - For the complete gamut of stock work - the complete inletting job, the accurizing of an erratic shooting gun and for the super-duper stock where the same techniques are used as by the fulltime stockmaker. GUN HOBBYISTS AND BUFFS - To accurize their present guns or to bed and accurize guns they are stocking; also, to simplify bedding barreled actions into inletted stocks purchased from stock manufacturers ... a great boon for the man who likes to do the job himself - and wants the best results. INSTRUCTIONS AND COLOR Acraglas in itself is amber-clear. To make it match your stock - black or brown - we furnish two special, acrylic dyes with each Kit. With them you can color the Acraglas mix to blend properly with the color of your individual stock - wood or synthetic. The brown dye nicely matches “normal” walnut but if your stock is exceptionally light walnut, or made of maple, myrtle, cherry, etc., you may want to leave out the dye for a closer match. Just remember, the color you see in the cup will darken somewhat when the Acraglas is in the stock. But, you don’t have to match the color, many shooters like to create contrast at the joining of barrel and stock to add a point of distinction to their gun and make sure others know they’ve taken the time to do a first-rate glass bedding job. Complete, easy-to-follow Instructions are packaged with each Kit. These tell you how to mix and use. FOLLOW THEM CAREFULLY. ACRAGLAS KIT - 2 fl. oz. (59 ml) Resin, 7⁄8 fl. oz. (26 ml) Hardener, 7⁄8 fl. oz. (26 ml) Release Agent, Floc, 2 Mixing Cups, Mixing Stick, Brown Dye, Black Dye enough to bed 2 Rifles. Complete Instructions. ACRAGLAS SHOP KIT - 28 fl. oz. (828 ml) Resin, 7 fl. oz. (207 ml) Hardener, 3 fl. oz. (89 ml) Release Agent, 8 oz. (227g) Floc, 24 3 oz. capacity Mixing Cups, 50 Mixing Sticks, 5 Packets Brown Dye, 5 Paks Black Dye and Instructions. Mfr Part: FGA01027 050806101227 The word ACRAGLAS has proven, during the many years it has been used by shooters, to be a true and fair product description. For Acraglas, as its name implies, is an accurizing material designed for the exclusive purpose of making a rifle shoot more accurately. Granted, it is a superior bedding compound used and sold as such by dealers, stock manufacturers and gunsmiths - but the fact remains: its prime purpose is to accurize a rifle. THE AMERICAN RIFLEMAN To quote L.R.W. in the American Rifleman Dope Bag, “Acraglas will be found an excellent preparation to correct poor bedding and the revitalized rifle should respond with considerably better accuracy.” “It’s a boon for the lazy, too, because if you are inletting a stock blank you simply cut out too much wood all the way around, gob the wood well with Acraglas, put the metal in (properly treated with release agent coming with the kit) and set aside for about 24 hours. When the metal is removed, the result is perfect bedding for the action - good, strong, and reliable bedding it is, too.” PROVEN IN THE FIELD As the manufacturers of Acraglas, we cannot help but be very proud, too, of the many individual shooters and teams who have won big bore regional and Perry matches with Acraglassed guns ... and of the hunters who have sent us “before and after” targets made when sighting in their game rifles after using Acraglas. The basic materials used in Acraglas are those developed for the aircraft industry. These we have adapted to gun work. Some of the many unusual features of Acraglas are: Acraglas shrinks less than 1⁄10th of 1% when hardening. This is very important to you as a shooter, for the tighter your bedding job, the better the job. It must be remembered, too, that many of the plastics will shrink more than 5% when hardening, thus canceling their true values as accurizing materials. So perfectly does Acraglas fit your barrel and action that any stamping marks in the steel will also be there in the Acraglas ... impossible to “Bed” any closer. Acraglas actually strengthens your stock because of its own great strength and resistance to breakage or warpage! Acraglas is acid proof, waterproof, has superior insulating qualities, resists alkalies and will not rot or deteriorate. It is quite well known that many of the so-called “plastic glasses” do deteriorate and products made from them are only guaranteed 5 years. Acraglas is highly resistant to impact and will not dent. Should it ever be damaged, or if an improper job is done the first time, it can easily be corrected or mended by using the same materials as in the Kit. Thus, it makes the perfect recoil shoulder. Unlike paints or air drying plastics, Acraglas hardens by chemical action. So, a hard surface indicates a hard interior ready for finishing. The mixture becomes hot before reaching setting temperature. It then “kicks over” and begins to harden, reaching full hardness in 48 hours, altho’ it can be worked, sanded and finished before then. Acraglas has a shelf life of over 5 years! Acraglas has been so compounded by our research engineers that you have ample time to properly seat the barreled action in the inletted stock before it starts to harden. Therefore, when using it you do not need to become nervous and rushed, but can take your time and do the First Class Job you are capable of doing. Being a superior bedding compound, you get a double- barreled benefit when using Acraglas: - An excellent bedding job that does not carry the stigma of “plastic bedding” and you have concentrated your real efforts on accurizing your gun - all at the same time! For your own enlightenment you should check among your shooting friends and note how many are proud of their guns being Accurized with Acraglas. Acraglas completely seals the inletted side of the gun stock against all moisture, gun oils, solvents and sprays. Moisture being absorbed by the stock can cause the finest woods to warp or twist, forcing the gun to shoot different groups on different days. Oils and solvents will eventually make the most beautiful of woods dirty looking where allowed to soak in and, in rare cases, actually ruin the wood. Acraglas has another feature that is strictly a side benefit - but, one our gunsmith customers have found out for themselves and use extensively. The bonding strength of Acraglas is phenomenal - will actually stick “anything to anything” (except certain poly-plastics). The letters in our files make one shake his head in wonder. It seems our gunsmiths have repaired everything from false teeth, toilet bowls, pipes, chairs, cribs, cars, radios, TV’s, skis, sleds, tables, flintlock rifles, caplock rifles and modern gun stocks without number. What it amounts to is this: You name something that has been busted and one of them has undoubtedly used Acraglas to fix it! But, we play this down. We are not in the glue business. There are a jillion glues but only one Acraglas! RELEASE AGENT Our traditional Release Agent and our easy-to-ship, Non-Flammable Release Agent selectively lets Acraglas bond to the stock but not to the barreled action. Both products present nearly indentical physical characteristics, and are applied in exactly the same manner with no noticeable difference in dry time. Both form a smooth, vinyl-like coating between the bedding compound and metal. Non-Flammable Release Agent is a non-flammable, non-hazardous formula that can be transported by air, immediately upon request, safely and legally within and outside the Continental U. S., so there’s no more waiting for ground shipments to arrive when you need an Acraglas kit or extra release agent in a hurry. WHO USES ACRAGLAS AND WHY STOCK MANUFACTURERS - For special custom accurizing jobs and for resale to dealer and retail accounts. PROFESSIONAL STOCKMAKERS - For obtaining skin-tight bedding around receivers, at the chamber on the barrel and at the forend tip on certain jobs. GUNSMITHS - For the complete gamut of stock work - the complete inletting job, the accurizing of an erratic shooting gun and for the super-duper stock where the same techniques are used as by the fulltime stockmaker. GUN HOBBYISTS AND BUFFS - To accurize their present guns or to bed and accurize guns they are stocking; also, to simplify bedding barreled actions into inletted stocks purchased from stock manufacturers ... a great boon for the man who likes to do the job himself - and wants the best results. INSTRUCTIONS AND COLOR Acraglas in itself is amber-clear. To make it match your stock - black or brown - we furnish two special, acrylic dyes with each Kit. With them you can color the Acraglas mix to blend properly with the color of your individual stock - wood or synthetic. The brown dye nicely matches “normal” walnut but if your stock is exceptionally light walnut, or made of maple, myrtle, cherry, etc., you may want to leave out the dye for a closer match. Just remember, the color you see in the cup will darken somewhat when the Acraglas is in the stock. But, you don’t have to match the color, many shooters like to create contrast at the joining of barrel and stock to add a point of distinction to their gun and make sure others know they’ve taken the time to do a first-rate glass bedding job. Complete, easy-to-follow Instructions are packaged with each Kit. These tell you how to mix and use. FOLLOW THEM CAREFULLY. ACRAGLAS KIT - 2 fl. oz. (59 ml) Resin, 7⁄8 fl. oz. (26 ml) Hardener, 7⁄8 fl. oz. (26 ml) Release Agent, Floc, 2 Mixing Cups, Mixing Stick, Brown Dye, Black Dye enough to bed 2 Rifles. Complete Instructions. ACRAGLAS SHOP KIT - 28 fl. oz. (828 ml) Resin, 7 fl. oz. (207 ml) Hardener, 3 fl. oz. (89 ml) Release Agent, 8 oz. (227g) Floc, 24 3 oz. capacity Mixing Cups, 50 Mixing Sticks, 5 Packets Brown Dye, 5 Paks Black Dye and Instructions. 120 oz. Resin and 30 oz. Hardener The word ACRAGLAS has proven, during the many years it has been used by shooters, to be a true and fair product description. For Acraglas, as its name implies, is an accurizing material designed for the exclusive purpose of making a rifle shoot more accurately. Granted, it is a superior bedding compound used and sold as such by dealers, stock manufacturers and gunsmiths - but the fact remains: its prime purpose is to accurize a rifle. THE AMERICAN RIFLEMAN To quote L.R.W. in the American Rifleman Dope Bag, “Acraglas will be found an excellent preparation to correct poor bedding and the revitalized rifle should respond with considerably better accuracy.” “It’s a boon for the lazy, too, because if you are inletting a stock blank you simply cut out too much wood all the way around, gob the wood well with Acraglas, put the metal in (properly treated with release agent coming with the kit) and set aside for about 24 hours. When the metal is removed, the result is perfect bedding for the action - good, strong, and reliable bedding it is, too.” PROVEN IN THE FIELD As the manufacturers of Acraglas, we cannot help but be very proud, too, of the many individual shooters and teams who have won big bore regional and Perry matches with Acraglassed guns ... and of the hunters who have sent us “before and after” targets made when sighting in their game rifles after using Acraglas. The basic materials used in Acraglas are those developed for the aircraft industry. These we have adapted to gun work. Some of the many unusual features of Acraglas are: Acraglas shrinks less than 1⁄10th of 1% when hardening. This is very important to you as a shooter, for the tighter your bedding job, the better the job. It must be remembered, too, that many of the plastics will shrink more than 5% when hardening, thus canceling their true values as accurizing materials. So perfectly does Acraglas fit your barrel and action that any stamping marks in the steel will also be there in the Acraglas ... impossible to “Bed” any closer. Acraglas actually strengthens your stock because of its own great strength and resistance to breakage or warpage! Acraglas is acid proof, waterproof, has superior insulating qualities, resists alkalies and will not rot or deteriorate. It is quite well known that many of the so-called “plastic glasses” do deteriorate and products made from them are only guaranteed 5 years. Acraglas is highly resistant to impact and will not dent. Should it ever be damaged, or if an improper job is done the first time, it can easily be corrected or mended by using the same materials as in the Kit. Thus, it makes the perfect recoil shoulder. Unlike paints or air drying plastics, Acraglas hardens by chemical action. So, a hard surface indicates a hard interior ready for finishing. The mixture becomes hot before reaching setting temperature. It then “kicks over” and begins to harden, reaching full hardness in 48 hours, altho’ it can be worked, sanded and finished before then. Acraglas has a shelf life of over 5 years! Acraglas has been so compounded by our research engineers that you have ample time to properly seat the barreled action in the inletted stock before it starts to harden. Therefore, when using it you do not need to become nervous and rushed, but can take your time and do the First Class Job you are capable of doing. Being a superior bedding compound, you get a double- barreled benefit when using Acraglas: - An excellent bedding job that does not carry the stigma of “plastic bedding” and you have concentrated your real efforts on accurizing your gun - all at the same time! For your own enlightenment you should check among your shooting friends and note how many are proud of their guns being Accurized with Acraglas. Acraglas completely seals the inletted side of the gun stock against all moisture, gun oils, solvents and sprays. Moisture being absorbed by the stock can cause the finest woods to warp or twist, forcing the gun to shoot different groups on different days. Oils and solvents will eventually make the most beautiful of woods dirty looking where allowed to soak in and, in rare cases, actually ruin the wood. Acraglas has another feature that is strictly a side benefit - but, one our gunsmith customers have found out for themselves and use extensively. The bonding strength of Acraglas is phenomenal - will actually stick “anything to anything” (except certain poly-plastics). The letters in our files make one shake his head in wonder. It seems our gunsmiths have repaired everything from false teeth, toilet bowls, pipes, chairs, cribs, cars, radios, TV’s, skis, sleds, tables, flintlock rifles, caplock rifles and modern gun stocks without number. What it amounts to is this: You name something that has been busted and one of them has undoubtedly used Acraglas to fix it! But, we play this down. We are not in the glue business. There are a jillion glues but only one Acraglas! RELEASE AGENT Our traditional Release Agent and our easy-to-ship, Non-Flammable Release Agent selectively lets Acraglas bond to the stock but not to the barreled action. Both products present nearly indentical physical characteristics, and are applied in exactly the same manner with no noticeable difference in dry time. Both form a smooth, vinyl-like coating between the bedding compound and metal. Non-Flammable Release Agent is a non-flammable, non-hazardous formula that can be transported by air, immediately upon request, safely and legally within and outside the Continental U. S., so there’s no more waiting for ground shipments to arrive when you need an Acraglas kit or extra release agent in a hurry. WHO USES ACRAGLAS AND WHY STOCK MANUFACTURERS - For special custom accurizing jobs and for resale to dealer and retail accounts. PROFESSIONAL STOCKMAKERS - For obtaining skin-tight bedding around receivers, at the chamber on the barrel and at the forend tip on certain jobs. GUNSMITHS - For the complete gamut of stock work - the complete inletting job, the accurizing of an erratic shooting gun and for the super-duper stock where the same techniques are used as by the fulltime stockmaker. GUN HOBBYISTS AND BUFFS - To accurize their present guns or to bed and accurize guns they are stocking; also, to simplify bedding barreled actions into inletted stocks purchased from stock manufacturers ... a great boon for the man who likes to do the job himself - and wants the best results. INSTRUCTIONS AND COLOR Acraglas in itself is amber-clear. To make it match your stock - black or brown - we furnish two special, acrylic dyes with each Kit. With them you can color the Acraglas mix to blend properly with the color of your individual stock - wood or synthetic. The brown dye nicely matches “normal” walnut but if your stock is exceptionally light walnut, or made of maple, myrtle, cherry, etc., you may want to leave out the dye for a closer match. Just remember, the color you see in the cup will darken somewhat when the Acraglas is in the stock. But, you don’t have to match the color, many shooters like to create contrast at the joining of barrel and stock to add a point of distinction to their gun and make sure others know they’ve taken the time to do a first-rate glass bedding job. Complete, easy-to-follow Instructions are packaged with each Kit. These tell you how to mix and use. FOLLOW THEM CAREFULLY. ACRAGLAS KIT - 2 fl. oz. (59 ml) Resin, 7⁄8 fl. oz. (26 ml) Hardener, 7⁄8 fl. oz. (26 ml) Release Agent, Floc, 2 Mixing Cups, Mixing Stick, Brown Dye, Black Dye enough to bed 2 Rifles. Complete Instructions. ACRAGLAS SHOP KIT - 28 fl. oz. (828 ml) Resin, 7 fl. oz. (207 ml) Hardener, 3 fl. oz. (89 ml) Release Agent, 8 oz. (227g) Floc, 24 3 oz. capacity Mixing Cups, 50 Mixing Sticks, 5 Packets Brown Dye, 5 Paks Black Dye and Instructions. ACRAGLAS Shop Kit, Non-Flammable 050806105676 The word ACRAGLAS has proven, during the many years it has been used by shooters, to be a true and fair product description. For Acraglas, as its name implies, is an accurizing material designed for the exclusive purpose of making a rifle shoot more accurately. Granted, it is a superior bedding compound used and sold as such by dealers, stock manufacturers and gunsmiths - but the fact remains: its prime purpose is to accurize a rifle. THE AMERICAN RIFLEMAN To quote L.R.W. in the American Rifleman Dope Bag, “Acraglas will be found an excellent preparation to correct poor bedding and the revitalized rifle should respond with considerably better accuracy.” “It’s a boon for the lazy, too, because if you are inletting a stock blank you simply cut out too much wood all the way around, gob the wood well with Acraglas, put the metal in (properly treated with release agent coming with the kit) and set aside for about 24 hours. When the metal is removed, the result is perfect bedding for the action - good, strong, and reliable bedding it is, too.” PROVEN IN THE FIELD As the manufacturers of Acraglas, we cannot help but be very proud, too, of the many individual shooters and teams who have won big bore regional and Perry matches with Acraglassed guns ... and of the hunters who have sent us “before and after” targets made when sighting in their game rifles after using Acraglas. The basic materials used in Acraglas are those developed for the aircraft industry. These we have adapted to gun work. Some of the many unusual features of Acraglas are: Acraglas shrinks less than 1⁄10th of 1% when hardening. This is very important to you as a shooter, for the tighter your bedding job, the better the job. It must be remembered, too, that many of the plastics will shrink more than 5% when hardening, thus canceling their true values as accurizing materials. So perfectly does Acraglas fit your barrel and action that any stamping marks in the steel will also be there in the Acraglas ... impossible to “Bed” any closer. Acraglas actually strengthens your stock because of its own great strength and resistance to breakage or warpage! Acraglas is acid proof, waterproof, has superior insulating qualities, resists alkalies and will not rot or deteriorate. It is quite well known that many of the so-called “plastic glasses” do deteriorate and products made from them are only guaranteed 5 years. Acraglas is highly resistant to impact and will not dent. Should it ever be damaged, or if an improper job is done the first time, it can easily be corrected or mended by using the same materials as in the Kit. Thus, it makes the perfect recoil shoulder. Unlike paints or air drying plastics, Acraglas hardens by chemical action. So, a hard surface indicates a hard interior ready for finishing. The mixture becomes hot before reaching setting temperature. It then “kicks over” and begins to harden, reaching full hardness in 48 hours, altho’ it can be worked, sanded and finished before then. Acraglas has a shelf life of over 5 years! Acraglas has been so compounded by our research engineers that you have ample time to properly seat the barreled action in the inletted stock before it starts to harden. Therefore, when using it you do not need to become nervous and rushed, but can take your time and do the First Class Job you are capable of doing. Being a superior bedding compound, you get a double- barreled benefit when using Acraglas: - An excellent bedding job that does not carry the stigma of “plastic bedding” and you have concentrated your real efforts on accurizing your gun - all at the same time! For your own enlightenment you should check among your shooting friends and note how many are proud of their guns being Accurized with Acraglas. Acraglas completely seals the inletted side of the gun stock against all moisture, gun oils, solvents and sprays. Moisture being absorbed by the stock can cause the finest woods to warp or twist, forcing the gun to shoot different groups on different days. Oils and solvents will eventually make the most beautiful of woods dirty looking where allowed to soak in and, in rare cases, actually ruin the wood. Acraglas has another feature that is strictly a side benefit - but, one our gunsmith customers have found out for themselves and use extensively. The bonding strength of Acraglas is phenomenal - will actually stick “anything to anything” (except certain poly-plastics). The letters in our files make one shake his head in wonder. It seems our gunsmiths have repaired everything from false teeth, toilet bowls, pipes, chairs, cribs, cars, radios, TV’s, skis, sleds, tables, flintlock rifles, caplock rifles and modern gun stocks without number. What it amounts to is this: You name something that has been busted and one of them has undoubtedly used Acraglas to fix it! But, we play this down. We are not in the glue business. There are a jillion glues but only one Acraglas! RELEASE AGENT Our traditional Release Agent and our easy-to-ship, Non-Flammable Release Agent selectively lets Acraglas bond to the stock but not to the barreled action. Both products present nearly indentical physical characteristics, and are applied in exactly the same manner with no noticeable difference in dry time. Both form a smooth, vinyl-like coating between the bedding compound and metal. Non-Flammable Release Agent is a non-flammable, non-hazardous formula that can be transported by air, immediately upon request, safely and legally within and outside the Continental U. S., so there’s no more waiting for ground shipments to arrive when you need an Acraglas kit or extra release agent in a hurry. WHO USES ACRAGLAS AND WHY STOCK MANUFACTURERS - For special custom accurizing jobs and for resale to dealer and retail accounts. PROFESSIONAL STOCKMAKERS - For obtaining skin-tight bedding around receivers, at the chamber on the barrel and at the forend tip on certain jobs. GUNSMITHS - For the complete gamut of stock work - the complete inletting job, the accurizing of an erratic shooting gun and for the super-duper stock where the same techniques are used as by the fulltime stockmaker. GUN HOBBYISTS AND BUFFS - To accurize their present guns or to bed and accurize guns they are stocking; also, to simplify bedding barreled actions into inletted stocks purchased from stock manufacturers ... a great boon for the man who likes to do the job himself - and wants the best results. INSTRUCTIONS AND COLOR Acraglas in itself is amber-clear. To make it match your stock - black or brown - we furnish two special, acrylic dyes with each Kit. With them you can color the Acraglas mix to blend properly with the color of your individual stock - wood or synthetic. The brown dye nicely matches “normal” walnut but if your stock is exceptionally light walnut, or made of maple, myrtle, cherry, etc., you may want to leave out the dye for a closer match. Just remember, the color you see in the cup will darken somewhat when the Acraglas is in the stock. But, you don’t have to match the color, many shooters like to create contrast at the joining of barrel and stock to add a point of distinction to their gun and make sure others know they’ve taken the time to do a first-rate glass bedding job. Complete, easy-to-follow Instructions are packaged with each Kit. These tell you how to mix and use. FOLLOW THEM CAREFULLY. ACRAGLAS KIT - 2 fl. oz. (59 ml) Resin, 7⁄8 fl. oz. (26 ml) Hardener, 7⁄8 fl. oz. (26 ml) Release Agent, Floc, 2 Mixing Cups, Mixing Stick, Brown Dye, Black Dye enough to bed 2 Rifles. Complete Instructions. ACRAGLAS SHOP KIT - 28 fl. oz. (828 ml) Resin, 7 fl. oz. (207 ml) Hardener, 3 fl. oz. (89 ml) Release Agent, 8 oz. (227g) Floc, 24 3 oz. capacity Mixing Cups, 50 Mixing Sticks, 5 Packets Brown Dye, 5 Paks Black Dye and Instructions.